Brand New Modern 4 Bedroom 4 Bathroom Town Home* in Festival Resort only few minutes from Disney. Imagine a place where the colors enchant you and the amenities make you smile! 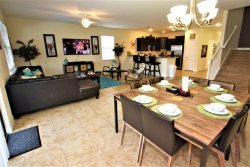 You have found it here in this amazing town home located in one of Orlando's newest communities, Festival Resort. Festival offers you a wonderful idyllic resort 'Downtown' area with an enviable Pool attraction. For those 'at home' days away from the parks, enjoy your own Private Splash Pool or the resort atmosphere to grab lunch at the snack bar! This home offers you charming, modern furnishings, with colorful accent walls & fun decorations throughout with just the right touch of class! Downstairs in your town home is the main Living Area with comfortable leather seating and a large Flat Screen TV(55inch) w/Cable. You have a nice view of the private Lanai area which features your own Splash Pool & Patio Seating with no rear neighbors and lake view. Relax on the Lanai with guest seating for up to 4 guests. The beautiful Dining Area Seats up to 6 with a pool view and you can accommodate another 4 guests at the Breakfast Bar. Your Kitchen features Stainless Steel Appliances, Upgraded Small Appliances, Granite Counter Tops, High Quality Dinnerware & Flatware. Additionally, you have every type of kitchen utensil you can imagine to help with meals on those 'nights in'. (Bedroom 1 - Downstairs) - King Bedroom w/Shared Hall Bathroom - Pillow Top King Mattress & Upgraded Bedding, Flat Screen TV w/Cable. The Upstairs Entertainment Area offers unique 'Theater' Color decorations, with a Big wall-mount Flat Screen TV W/Netflix/ Roku to enjoy a Movie. The Upstairs has two office desks for work center area. Guest will be provided with an amenities card which will grant access to Oversized resort pool with Private Cabanas, Kids Water Park, 18 Hole Miniature Golf Course, Volleyball Court, Restaurant and Bar, Mini Mart, Ice Cream Parlor, Fitness Center, & Kids Activity Center. Be the envy of your friends, tell them you stayed in an amazing condo at Festival Resort and loved every minute! Located in the heart of downtown Championsgate! Home to World Famous Golf Courses. Restaurants, Grocery Store, Pharmacy, Gas Stations and others business only 2 minutes driving. all at easy access from Festival gated resort community. Less than 10 minutes away from Disney World! Festival Resort is only a few moments drive to grocery shopping, restaurants and other area happenings. Easy access to the major attractions like Walt Disney World Theme Parks (10min), Universal Studios & Islands of Adventure(23min), Legoland (25min) and many other Attractions.